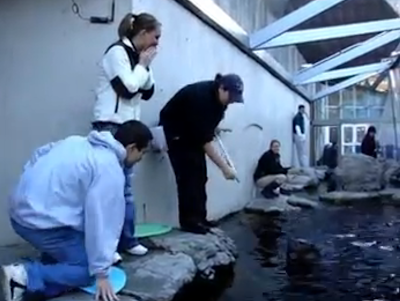 Chuck the harbor seal helps propose! Not only is Chacoda a skilled voice artist, he's also pretty romantic! This week he teamed up with Lindsay to help this lovely young couple get engaged! Below are some screen shots of what happened. The Boston Globe has the full video here. Chacoda brings the ring to the waiting groom. The groom proposes while Lindsay displays the sign that reads "Will you marry me." Calling all seal fans - Chacoda ringtone!